Fluke season will open in a couple of days. Spro Jigs, super popular for fluking, are inconvenient to store. They’re always in the way in the tackle box, and you pick around Spros carefully. But the company Spro has made this box to store the jigs. Slide the hook into one of the slits in the foam. That holds them in place reasonably, and keeps each jig parallel to each other. Close the lid to keep them secure. The box is easily opened with one hand, the company notes. 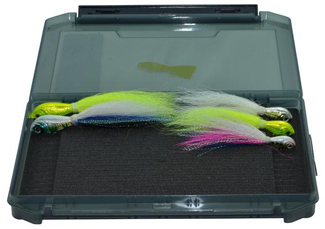 The rounded corners help make the box easy to get out of a tackle box or bag or boat storage, it says. 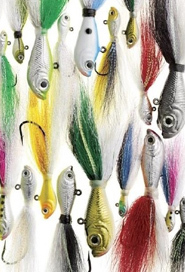 Spro Jigs, specifically named the Spro Bucktail Jig because of the hair from a deer’s tail, have a uniquely shaped head that gives the lure a natural gliding action, the company says. When jigged, the body stays parallel, including because of the placement of the eyelet. The jigs include a quite sharp and durable Gamakatsu hook. To see the Spro Jig Box online, visit Spro’s website.